U. Of Maryland Says It Will 'Part Ways' With Football Coach DJ Durkin University President Wallace Loh says "a departure is in the best interest of the University, and this afternoon Coach Durkin was informed that the University will part ways." University of Maryland head coach DJ Durkin was fired on Wednesday, a day after officials announced he could keep his job. He is pictured in November 2016. 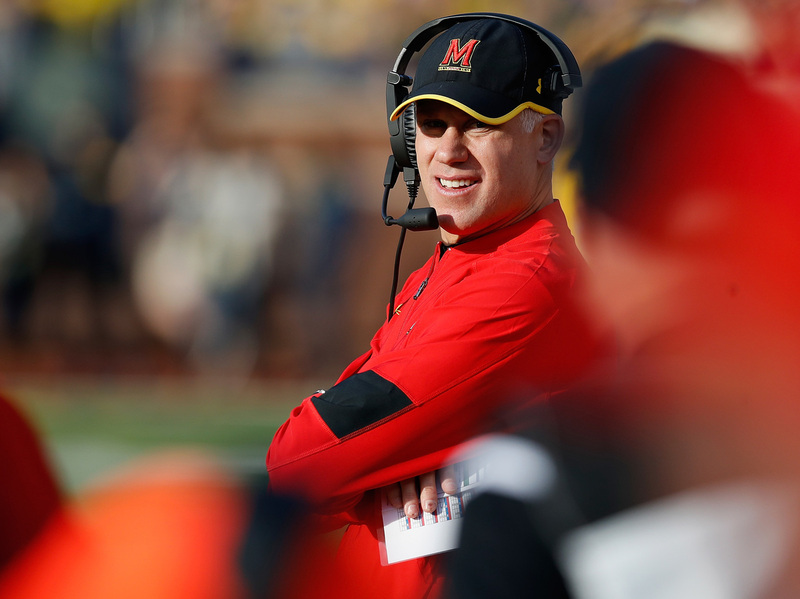 A day after the University System of Maryland's board of regents chose to reinstate the head coach of the Terrapins, university President Wallace Loh announced on Wednesday he had fired DJ Durkin. "A departure is in the best interest of the University, and this afternoon Coach Durkin was informed that the University will part ways," Loh wrote in a letter addressed to the University of Maryland community. Severing ties with Durkin was a "difficult" decision, Loh said, but added, "it is the right one for our entire University." Durkin has been accused of fostering an unhealthy culture of bullying among the team before the death of offensive lineman Jordan McNair earlier this year. "The chair of the Board of Regents has publicly acknowledged that I had previously raised serious concerns about Coach Durkin's return. This is not at all a reflection of my opinion of Coach Durkin as a person," Loh wrote. The decision to fire Durkin is a complete reversal from an announcement by the board of regents on Tuesday, following months of investigation into the university's football culture after McNair's death. That announcement cleared the path for the coach to resume running the football program after months of paid administrative leave. McNair, who was sophomore, died on June 13, weeks after collapsing from heatstroke during a team workout on May 29. Hundreds of students were expected to gather in the heart of campus on Thursday to protest Durkin's reinstatement, The Baltimore Sun reported.